After a night animated by an interesting incident that my roommates Quintana and Maya will never forget, I picked up V again to finally visit the Kremlin while we could. We found out upon arrival that it was a groups-only day, but lucky for us we were picked up by an English-speaking guide named Boris along with a bunch of others, and enjoyed a good tour. 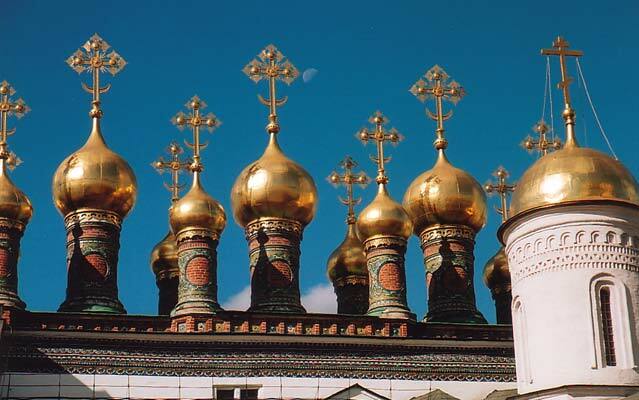 The Kremlin, meaning "fortress", is the biggest fort in Europe with its 2.3 km of walls. The current fortress was built by 15th-century Italian architects over foundations leftover from the Tatar occupation. We passed the Grand Kremlin Theater, with its 5000 seats, the Yellow House which is Putin's office, the three yellow buildings built by Katherine the Great as barracks, with the cannons lining the wall… Those, a total of 679, were collected from Napoleon's army after its precipitous retreat from Moscow in 1812… They had had to eat their own horses, and so had to leave the cannons behind. Within these walls one can contemplate both the world's largest bell and its largest cannon (of the time), respectively known as the tsarina and tsar of their kind. The bell had never been used when a fire broke out, and some genius threw cold water on the bell to cool it down. As Boris put it: "Hot metal cold water produced something not pleasant." The bell not only cracked, it dropped a piece of metal of 11 tons. It seems the bell makers ended up in Siberia. As for the 86-caliber cannon, despite being a feat of engineering it could only have fired 10 times. However, it proved to be an efficient psychological weapon, its mere presence on the fortification wall making the enemy run fast. 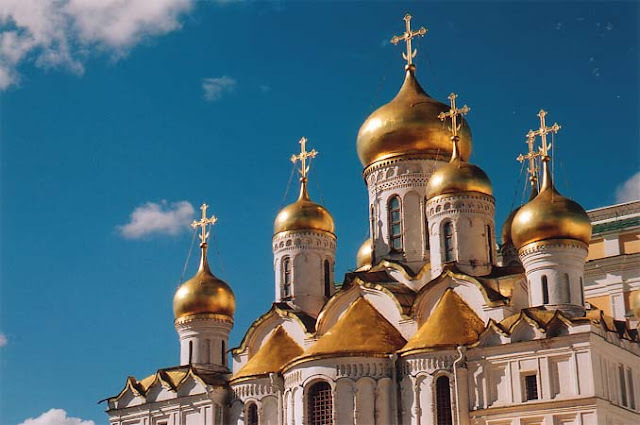 I was more interested in the Sobor Square (sobor meaning "cathedral"), highly unusual in that it bears no less than three cathedrals, as opposed to the single cathedral-square combination that is the heart of European cities. The life of a tsar began and ended in this square, for it is there he was enthroned, that he prayed daily, and then laid to rest. 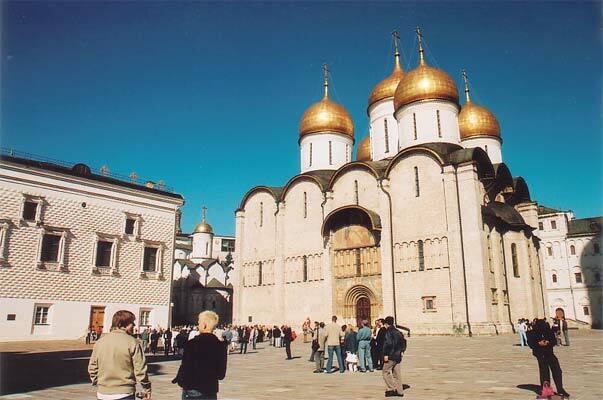 The cathedral of the Assumption, also called Sobor of the Dormition (Успенский Собор), was the coronation place for all tsars. Its beautifully simple exterior brings out the splendour of its pure gold domes and makes the discovery of the interior all the more impressive: every inch of the wall surface, including the columns, is covered with frescoes of holy figures. Boris explained the custom in the Russian orthodox church: there are no seats so people either stand or kneel on the ground; no music is played because the audience sings a capella; you don't bring a Bible with you because the idea of all the frescoes is that you enter the Bible itself; they pray to the East because that symbolises the place where Christ was born; the altar is invisible, hidden behind the massive iconostasis (that is the case in all Orthodox churches but they're usually smaller and don't wall off such a large part of the church); they sign themselves three times, with three fingers, representing the Holy Trinity, and starting with the right shoulder (other Christians start with the left). I also noticed that the sign of the cross is followed by a deep bow and that before entering a church women tie a scarf over their hair. 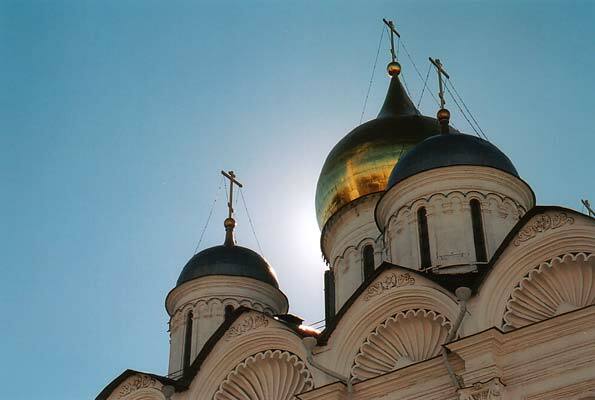 Right in front of the iconostasis, under the central dome, there is a little cross on the floor marking the exact centre of the cathedral, and the place where the tsar was crowned, the "place under God". Ten times a year the tsar would return to this church to pray, always sitting in this spot, while the tsarina had her dais behind him to the left, and the patriarch the same to the right. There was one exception to this long-lasting custom: Ivan IV, known as the Terrible, who managed the impossible feat of unifying Russia by simply killing all the opposition, and kicked out the Tatars forever. He was considered to be God, and a special dais was built for him to pray. The dais is still there and nobody, not even Stalin, has dared occupy it in 400 years. Among the icons on exhibit there is a 12th-century one, Our Lady of Tenderness, the state of conservation of which is nothing short of miraculous. Whereas other icons turned black with time and required restoration, it kept its original colours without human intervention. Finally, an anecdote about the huge silver chandelier that hangs in the cathedral looking dangerously heavy: when Napoleon's army fled Moscow, they did manage to take with them much silverware from the Kremlin. Boris says that when the Russian army entered Paris, they found them in a pile, attempted to purify them by fire, and when they melted, made this chandelier with them instead. 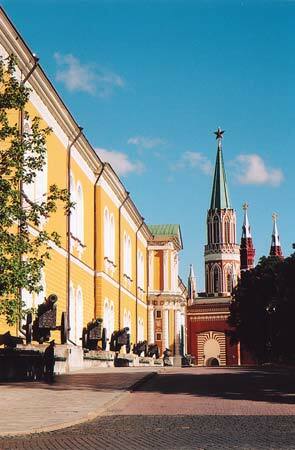 The Cathedral of the Annunciation (Благовещенский Собор) was visited by the tsar for his prayers three times a day. It has a particularly warped circulation because the tsar entered from the West, the patriarch from the North, and the rest from the East. As if that was not enough, there was the matter of Ivan's fourth wife (out of 7). Russian religion only allows three marriages, but who was going to dare tell Ivan the Terrible "you can't"? The priest he asked told him "You may marry a fourth time, but that gate [the Western one reserved to the tsar] will be forbidden to you." "Is that all?" said Ivan, and he opened a fourth gate to the south to abide by the commands of his church and still marry. 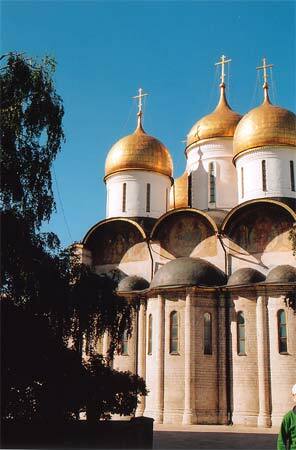 The ground of this church is of semi-precious jasper and agate brought by Ivan from Rostov, with one notable white stone where he kneeled to pray. Just before leaving we caught an unexpected treat: a chorus inside the church space with its perfect acoustic. It was a moment of rare magic. Also bordering the square are other spectacular structures. There's the Faceted Palace, a souvenir left by the Italian architects in the purest Italian Renaissance style – again destroyed by Stalin and then rebuilt. 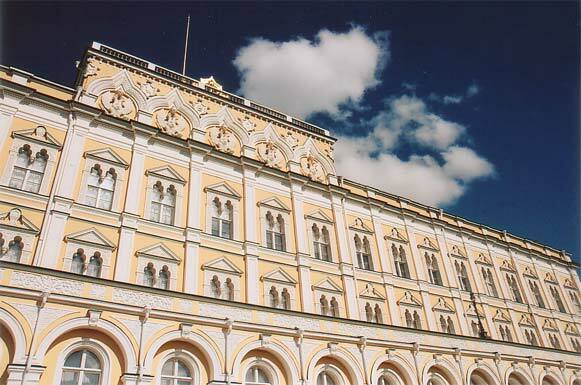 Next and behind it, the queen's palace, nicknamed the Golden Cage: in pre-Peter the Great Russia, before western usages were adopted, women were cloistered and the queen was no exception. She lived and prayed separately from her husband. 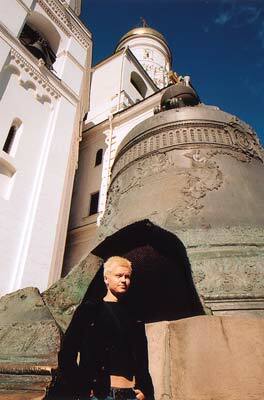 Across stands the Belltower of Ivan the Great, whose small bells meant good news and the big bells bad news. The tour came to an end and we parted in front of the Armory, that I wanted to see. It was worth it, but V and I came out weeping gold. I'm sure they could buy all of Lebanon with everything in it with the contents of these rooms. 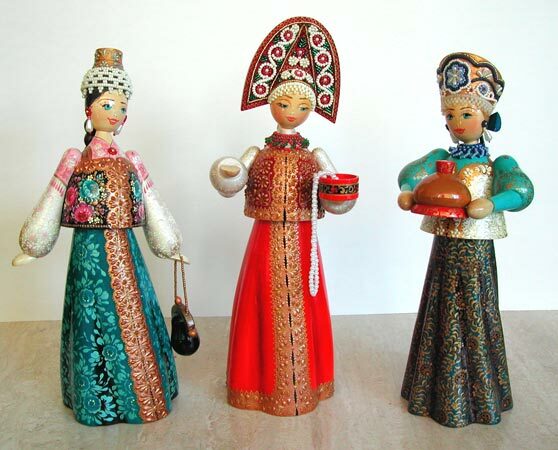 I took Vicken to the State History Museum gift shop where I had previously seen the most stunning wooden dolls and picked three to be my birthday present. I also picked up the unavoidable political nesting doll that has everyone from Lenin to Putin. We then collapsed in what I call the "green triangle" just south of the Red Square, behind Basil's, for a nap after which we practiced some Taiji and Wushu under the unsurprised eyes of a bunch of locals who were equally enjoying the grass. I can't get over how well-known and popular Wushu is in Russia. Every evening of the championship they aired the highlights of the competition for two hours; every person on the street we mentioned it to knew exactly what we were talking about.